The Scosche MagicMount PowerBank ($60 MSRP; $50 on Amazon) is a nifty Lightning connector battery pack that recharges an iPhone 6s or SE more than once through an attractive, damage-resistent case that connects firmly via a strong magnet. 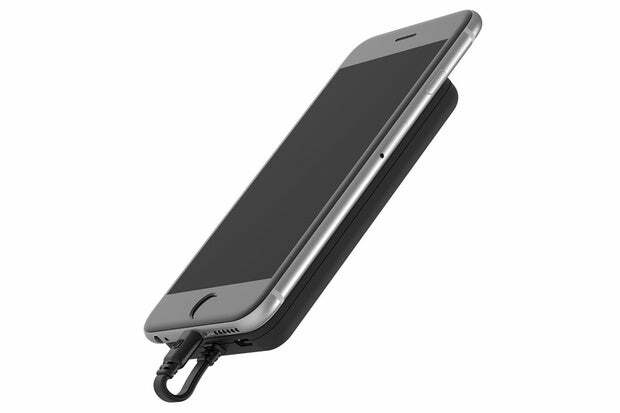 The MagicMount requires adhering a magnetic plate to the back of your phone or phone case and it’s not cheap. But given its utility and inclusion of a Lightning connector, it compares favorably to other alternatives. This battery pack isn’t an iPhone case with a battery built in, but it tries to bridge the best of both worlds. The battery’s magnet is covered with a rubbery substance, and there are two plastic pads above and below it to prevent scratching an iPhone. The battery can be used with a magnetic pad placed either directly on the back of an iPhone, or with an iPhone case, where the pad is attached inside or outside the case. The battery comes with both a large and small plate as well as a thin adhesive plastic sheet you can insert between the phone and the plate to make it easier to remove later. The neodymium magnetic connection is very strong—make sure and keep the battery pack away from any hard-disk drive! I’ve switched over almost entirely to solid-state drives (SSDs), but nearly put the battery pack down right next to a backup drive I’d forgotten was an HDD. I wouldn’t put this battery pack in a messenger bag next to a laptop with an HDD. With direct battery pack to magnetic plate contact, using the small plate, I found it nearly impossible to move the PowerBank at all even with worryingly vigorous shaking. I couldn’t dislodge it a bit in any direction except with a strong whack of the heel of my palm perpendicular to the plane where the magnetic and plate attach. Even then, it moved only millimeters. If your iPhone experienced that kind of severe, repeated shock, the battery coming off would likely be the least of your worries. Recharging the PowerBank itself is far slower, as the battery only accepts a 1 A input, which requires a Micro-USB cable (supplied) and a charger (not). Depending on the model of Mac or charger you have, the battery might also take power more slowly than 1 A. I used a RAVPower Turbo+ Wall Charger, which can supply up to 2.4 A, and the Scosche unit recharged in about three hours. You can’t recharge a phone and charge the PowerBank at the same time, however. 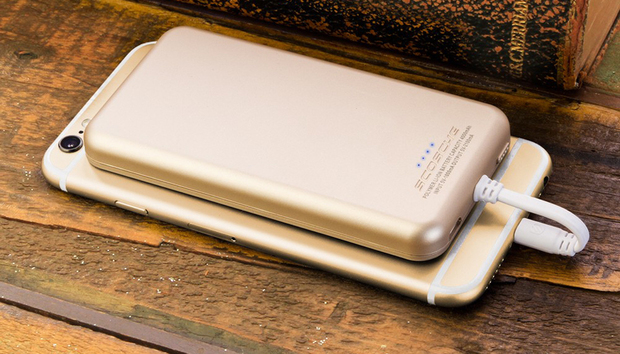 The PowerBank compares favorably to the $100 iPhone 6s Smart Battery Case in price, capacity, and flexibility. It’s not a case, so you can remove it without a hassle. And while the tested battery capacity was less than I’d hoped, the PowerBank does offer about 50 percent more charge than the available charge several testing sites have found with Apple’s case. The only issues are around the Lightning connection. The PowerBank has a robust looking flat cable, but it could be damaged if you don’t store it well or if you compress the cable while it’s plugged into an iPhone. I wouldn’t put it into a back pocket cable side down, nor sit down with it in a pocket with the cable side up. And Apple’s case has pass-through Lightning for charging and accessing the phone. Apple also passes through battery status to iOS for its smart case; with the Scosche, you need to look at the back and press its battery-status/on-off button to see it light up one to four tiny blue LEDs—or flash just one to indicate it’s almost out of juice. Looking at standalone batteries, a battery with a single 2.4 A Type-A USB port, an integral Micro-USB cable, and twice the tested capacity is just $20—the EasyAcc 6,000mAh Ultra-Slim. However, that requires carrying a separate Lightning-to-USB cable, and a battery that isn’t designed to be attached to your phone. Scosche seems to have created nearly the best possible version of a magnetically attached battery for an iPhone. Its price is slightly too high for the capacity, but not for its other features. For someone who wants all the advantages and isn’t concerned about pocketability nor magnetic interaction with a laptop or other HDD, it’s a nearly perfect fit. News roundup: Does the blame lie with Equifax or Apache? News Roundup: Should hacking be considered an act of war?